The Red Ozier press, a private press noted for fine quality limited editions of books, pamphlets, and broadsides of unpublished poetry and prose fiction by living authors, was founded in 1976 in Madison, Wisconsin, by Steve Miller. In 1979 Miller moved to New York City, established the press there, and took on as co-proprietor Ken Botnick. 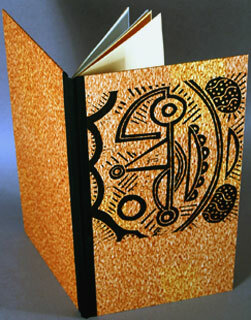 Miller now resides in Tuscaloosa, Alabama, where he is Director of the Book Arts Program at the University of Alabama. New York City, New York: Red Ozier, 1987. Edition of 75. 6.75 x 12"; 20 pages. Van Dijck types printed in black and green on mouldmade Frankfurt. The title page has a green vertical rule with a triangular bullet in rust before the author's name. Two illustrations by Richard Mock: one within the text, printed in brown with bronzing powder mixed into the ink, and one in black on the front cover. Quarter-bound in black linen and pastepapers by Claire Maziarczyk. Pumpkin-colored endsheets. Design, printing, and binding by Ken Botnick and Steve Miller. Signed by Paz and Weinberger on the colophon, by Mock on his internal illustration. 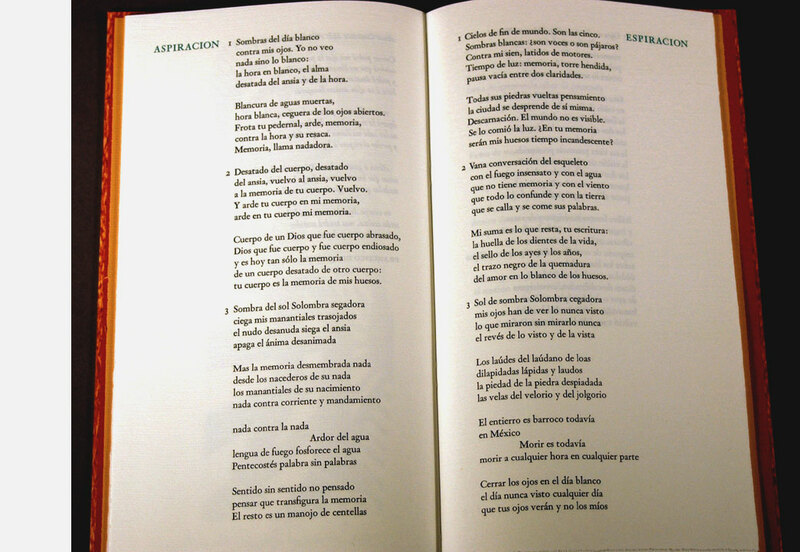 Four poems by Octavio Paz (1914 - 1998): "Amor Constante Más Allá de la Muerte" ["Love Constant Beyond Death"]; "Aspiracion" ["Aspiration"]; "Espiracion" ["Respiration"] and "Lauda" ["Tomb"]. Translation into English by Eliot Weinberger. Bilingual text accompanied by Richard Mock's artwork. Roberto Gonzalez Echevarria, Professor of Spanish at Yale University, The New York Times, May 15, 1988: "In his 1960 book, Homage and Desecrations, Mr. Paz rewrote ''Constant Love Beyond Death,'' a famous sonnet by the 17th-century poet Francisco Quevedo, thereby claiming as his poetic antecedents the baroque poets, whose echoes were audible in his poetry much earlier. His return to the baroque is emblematic. Realizing that the language inherited from the Spanish-language Romantics was derivative and hollow, modern Spanish poets reached back to Quevedo, his contemporary Luis de Gongora and their disciples as the only worthy models, poets who had achieved an original poetic revolution. Mr. Paz is torn between the glittering, imagistic world of Gongora and the wit, paradox and sober vision of Quevedo, but he seems to settle finally on the latter as a mentor, and on the 17th-century Mexican nun and poet Sor Juana Ines de la Cruz. Quevedo's language, oscillating between excrement and the most purified love, repulsion and desire, is particularly appropriate for Mr. Paz's sense of the failure of history."